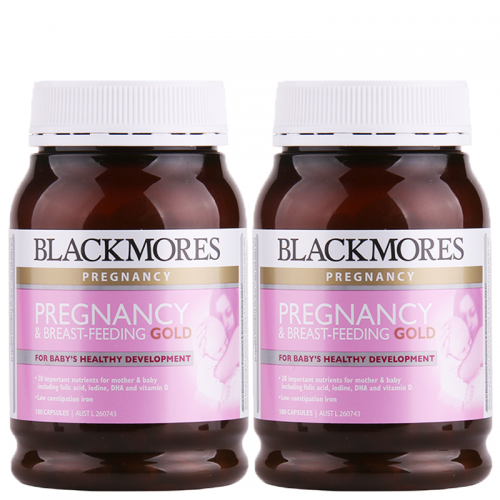 Blackmores Pregnancy & Breast-Feeding Gold provides an ideal daily dose of 20 important nutrients for mother and baby including folic acid, iodine, DHA and vitamin D3. With a low-constipation iron. Folic acid – this product contains 500 μg of folic acid, as it is recommended that women of childbearing age take 400-500 μg of folic acid per day for at least one month before pregnancy and for the first 3 months of pregnancy. Iodine - Requirement for iodine is increased during the whole pregnancy, especially the first 20 weeks. Australian women are typically not receiving enough iodine. The National Health and Medical Research Council (NHMRC) recommends that pregnant and breast-feeding women take an iodine supplement containing 150 μg*daily. Vitamin D3 may cause hypercalcaemia (high calcium levels) if taken with thiazide diuretics. Consult your healthcare professional before use if taking a diuretic (fluid tablet). Iodine may interfere with treatment for thyroid conditions. Consult your healthcare professional before use if suffering from a thyroid disease.